Nowadays there is hardly a civilized corner of the world that has no access to the Internet. Social media, websites like Facebook, Instagram or Twitter are the one virtual place and way for everyone to be closer to anyone. This makes them incredibly influential and having the might to change things for the better or worse with instant informational spread and it being open for discussions. We now have another documentary proof of it. You certainly remember the surprise, which the extravagant Italian fashion house established by Valentino Garavani displayed at Paris Fashion Week back in March: it created a stunning collection with marvelous samples, full of divine colors, which the models rocked on the runway when suddenly the show went unimaginably fantastic with big surprises for everyone. 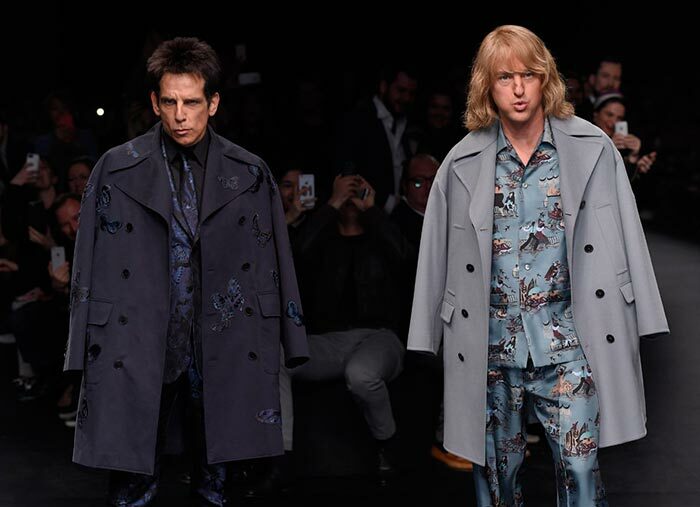 Paris Fashion Week was the witness of a sudden shock when unexpectedly out of nowhere the widely popular characters from “Zoolander 2′ Derek Zoolander and Hansel McDonald ” Hollywood actors Owen Wilson and Ben Stiller ” appeared on the runway	making everyone’s jaw drop. The crowd, full of celebrities, journalists and buyers went mad at their ridiculous arrival. This occurrence played a big role in Valentino‘s media engagement. “We hadn’t seen Valentino up there ranking before so it made us want to dig in,’ Tanya Yuki, founder and chief executive officer at famous social analytics firm Shareablee stated. The firm collected information on top 25 luxury brands’ social interactions on Facebook, Twitter, and Instagram. Tanya Yuki explains that the appearance of the two comedy characters at the fashion show had an unimaginable influence on Valentino’s social media engagement. The study revealed data on the leaders of the list and it turned out that Valentino was the first to open the list with 30 million media interactions in Facebook, Twitter and Instagram. Additionally, Valentino was followed by Michael Kors, Victoria Beckham, Christian Louboutin, Dior, Luis Vuitton, Dolce & Gabbana, Versace, Burberry and Moschino. The second mostly spanned brand was Michael Kors with an image of a splendid bag featuring 302,000 interactions. Year after year, as studies show, social engagement is rising more rapidly and with the help of this media users follow and get quickly updated by their cherished brands having an open access to their new arrivals. Compared to the previous year, in 2015 social media engagement has risen for about 5.4 percent in Facebook, Instagram and Twitter. The 25 brands involved in the list all in all reached the total of 670 million social interactions, taking into account all the likes, shares and comments. The Luxury car brands were also involved in the listing and some of them (Mercedes Benz, BMW) had a leading role in the list. Though car brands were a success in the list, they could not outnumber fashion brands as the top performing luxury category. The latter had approximately 382 million social interactions from January to June. Summing up, it’s unquestionably evident that Zoolander’s arrival at the show with the video showing the famous duo taking a “selfie’ with iPhone mounted Valentino’s rank in social media engagement securing its first place on the list of the most luxurious brands.